The LPI-JSC Center for Lunar Science and Exploration is excited to announce a student field camp opportunity coming this fall! The Field Training and Research Program at Meteor Crater is organized under the auspices of the NASA Solar System Exploration Research Virtual Institute (SSERVI), which is designed, in part, to train a new generation of explorers for the Moon and beyond. The Field Training and Research Program at Meteor Crater is a week-long geology field class and research project based at Barringer Meteorite Crater, Arizona, more popularly known as Meteor Crater. The goal will be to introduce students to impact cratering processes and provide an opportunity to assist with a research project at the crater. Skills developed during the field camp should better prepare the students for their own thesis studies in impact cratered terrains, whether they be on Earth, the Moon, asteroids, Mars, or some other solar system planetary surface. The field camp is designed for graduate college students in geology and planetary science programs, although advanced undergraduate students will be considered if they have successfully completed a summer field geology program and have a demonstrated interest in impact cratering processes. U.S. and international students are eligible to apply. The fourth edition of the program will run from September 3, 2016, through September 11, 2016. Students are responsible for transportation to and from Flagstaff, Arizona. Transportation will be provided from Flagstaff to Meteor Crater. Additional logistical details will be provided to selected participants. 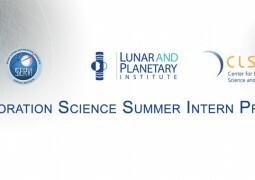 LPI is now accepting applications for the 2019 Exploration Science Summer Intern Program. The application deadline is January 25, 2019.